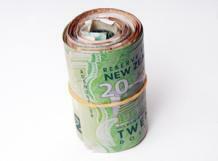 Wellington, July 24 NZPA - The money a Mapua man withdrew in anger from Westpac yesterday has, in a round about way, ended up back at the bank. The Nelson Mail reported that artist Roger Griffiths deposited his money at the Nelson Building Society, which uses Westpac as its bank. Mr Griffiths withdrew all of his $190,000 savings in $20 notes from Westpac yesterday because the bank would not approve a mortgage application.